HP‘s TouchPad and Palm devices may be long and gone, but webOS (the mobile OS that these devices ran off of) has been alive and well despite its hardware extinction, mostly thanks to its open-source status. Open webOS, as its now called, went into beta in August, and now a month later, a final stable build is ready for consumption as version 1.0. The 1.0 release offers some changes that the Open webOS team hopes will offer major new capabilities for developers. The team also mentions that over 75 Open webOS components have been delivered over the past 9 months (totaling over 450,000 lines of code), which means that Open webOS can now be ported to new devices thanks to today’s 1.0 release. 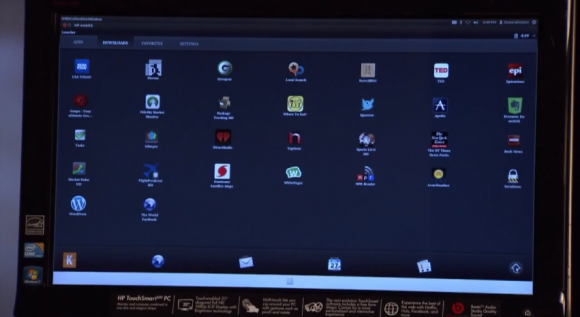 In the video below, Open webOS architect Steve Winston demoes the operating system on a HP TouchSmart all-in-one PC. He mentions that it took the team just “a couple of days” to port Open webOS to the PC that he has in front of him. The user interface doesn’t seem to be performing super smoothly, but you can’t really expect more out of a 1.0 release. Winston says that possible uses for Open webOS include kiosk applications in places like hotels, and since Open webOS is aimed to work on phones, tablets, and PCs, there’s the possibility that Open webOS could become an all-in-one solution for kiosk or customer service platforms for businesses. Obviously, version 1.0 is just the first step, so the Open webOS team is just getting started with this project and they expect to only improve on it and add new features as time goes on. ‘Separate platforms are no longer necessary once you have the correct standardisation and inter-operation,’ said Eich. Apple’s iOS, Microsoft’s Windows Phone, RIM’s BlackBerry OS 10 and Google’s Android operating systems are all ‘walled gardens,’ according to Gal, meaning that all of the above are in it for one reason: to make money. So what is Mozilla getting at here? Simple: dump the standard smartphone operating system, forget Apple and Google, and embrace the freedom of pure HTML5. Gal tells us that because the B2G stack is based on HTML5 there are literally millions of developers out there that know how to create content for the platform. There will also be plenty of opportunities for developers to make money from their creations as well, according to Gal. Google and Mozilla have developed technology that lets web developers manifest their entire site, including payment methods, into an icon that can be placed on a B2G device’s homescreen. But all this, Gal tells us, is still work in progress. Boot 2 Gecko is still in its embryonic stages at present – but the ball has certainly begun rolling. Persona, featuring BrowserID, is one such personal identity system. 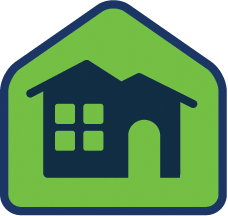 Persona lets users use their email address and a single password to sign in or buy materials and media. Mozilla demoed Persona at MWC 2012. But what’s most impressive about B2G is how well it runs on low-end hardware. During our meeting with Gal and Eich, we got a demo of B2G running incredibly smoothly on a $60 handset with a 600Mhz CPU and just 128MB of RAM. Gaming, web browsing, video and typing were all seamless. Gal also confirmed that Qualcomm is partnering with Mozilla on its B2G project. B2G is based on the same web-rendering engine as Mozilla’s Firefox browser, meaning that it is extremely lightweight when compared to Android and iOS. For this reason getting smartphone-level performance out of a budget mobile handset suddenly becomes a reality. 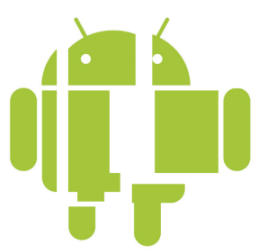 ‘Google’s Android platform is too hardware dependent,’ says Gal. ‘Android 4.0 demands 512MB of RAM as a minimum for instance. Mozilla’s web stack allows OEMs to produce $60 handsets with smartphone-like performance,’ said Gal. During a lovely September week in 2011, Microsoft Windows 8 was announced and launched for developers. The event this launch occurred at was what Microsoft was presenting as a welcome to Windows 8, especially in regards to the 5,000 developers at BUILD, launching the platform with there eyes directly fixed on applications, the whole situation a large opportunity for developers. This is the beginning of Windows 8 as it exists in a sense that there’s no product launch here from Microsoft, instead there’s an opportunity for 3rd party developers to get on board here right at the start of the next-wave OS. What lies beneath is a living document which takes what Microsoft Windows 8 is at the start here in 2011 and how it will evolve over time. Three years ago was when Windows 7 launched, since then 450 million copies have sold. Inside September 2011, the amount of users using Windows 7 has finally trumped the amount of users using Windows XP on the consumer market. Microsoft tells us they know this because they’re working with the numbers coming from machines hitting the Windows Update Service. As with any update to a new version of a major operating system, one must ask a similar question as – and you’ll have to allow me to nerd out for a moment here – Alan Bradley from TRON when he asked what changes had REALLY been made to the system that Microsoft would find it necessary to give it a whole new number. Microsoft brings you Windows 8 as a operating system that is said to improve everything they brought forth in Windows 7, and what’s more, every bit of software that runs currently on Windows 7 will be able to run on Windows 8 without a problem. ARM chips equal integrated engineering. Where X86, Microsoft says, was the same for every system, ARM chips are optimized for unique situations. Like what Microsoft says about software made for working on Windows 7 now also working on Windows 8, so too does everything they present here work on ARM chips. Julie Larson Green, Corporate Vice President of the Windows Experience at Microsoft noted during the week of the reveal of Windows 8 that they had started planning Windows 8 in June of 2009, before they even shipped Windows 7 out the door. Of course changes in both industry and technology spark change, and in this mobile landscape and move by many from one platform to another and/or the adoption of several platforms happening by the public, Microsoft planned accordingly. Microsoft wanted to top the release of Windows 7, but they did not want to do it in a way that was either linear or reactive – this being an interesting goal of course at that time as the idea of a tablet computer simply wasn’t a reality at the time – so what is there to react to? 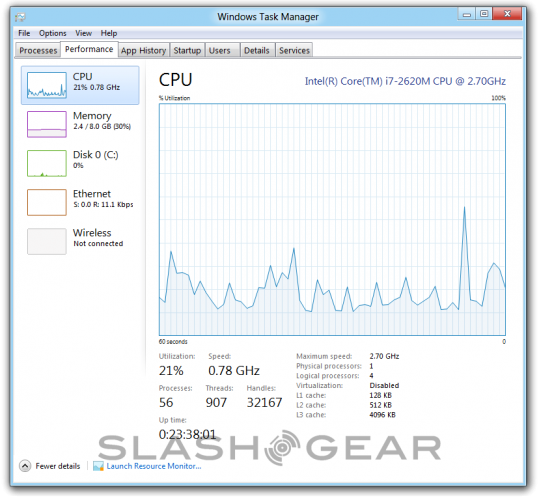 In Windows 7 there were studies on form factor, user action models, and best of all touch. Microsoft has noted that they were the first group to add touch to a major operating system. As you know well, since that time, touch has all but consumed the mobile market, and recent developments in non-mobile computing have trended toward touch as well to a degree. With this, the demand for developers to create apps for every single little function, one by one, this showing itself prevalently again on mobile, but non-mobile beginning to take back what is theirs in the recent past as well with on-device app stores on all machines. 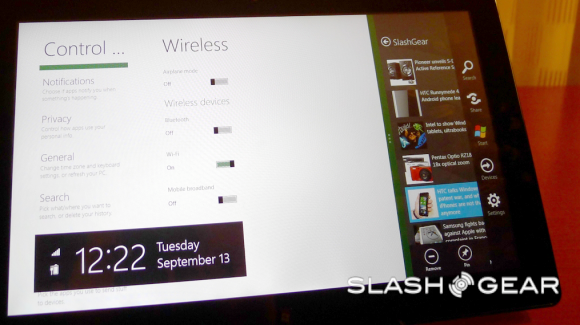 These are only two of a whole slew of points Microsoft touched on during the BUILD conference showing off the first real look at Windows 8 in September of 2011. Then there’s a Start Screen. This is the place where you’ll return all the time before and after moving to other screens and apps. You’ll again recognize the look of this space as being a rather Windows Phone experience, and as each app is represented by what Microsoft calls a “tile”, you’ll certainly feel at home if you’re an avid Windows Phone user. 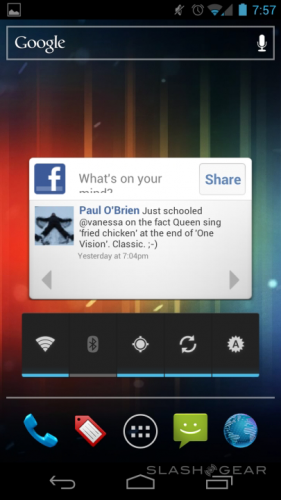 Each tile has the ability to show off different actions before its activated to reveal the app inside, movement and, for example, feeds showing social networking news. 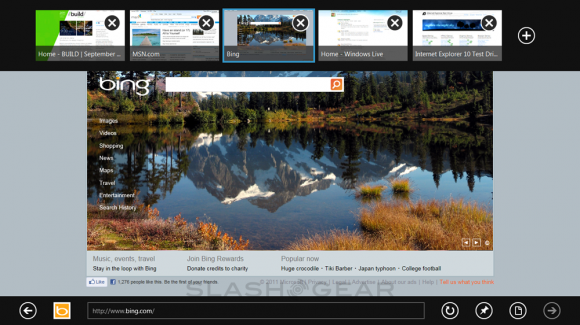 The “serendipity of the web” has here been brought into Windows. Tiles can express essentially anything you want and are themselves resizable and customizable. Tiles can open up to apps or they can sit by themselves and work. There are “groups” that can hold tiles “like folders” as they say, and there’s a new feature called “Semantic Zoom.” What this Semantic Zoom does is to pull you back from your interface in a way that you’ve never been able to do on a Windows device before. Fast and fluid touch language throughout, allowing you access to all of your media, all of your content, all of your apps at once. There is a new kind of app called Metro-Style Apps. The first thing that makes a Metro-Style app what it is full immersion. What Windows has done here is to change what they’ve done in the past, that is adding widgets and “doodads” all around the majority of apps and is now being a bit more humble, letting the app take the show. 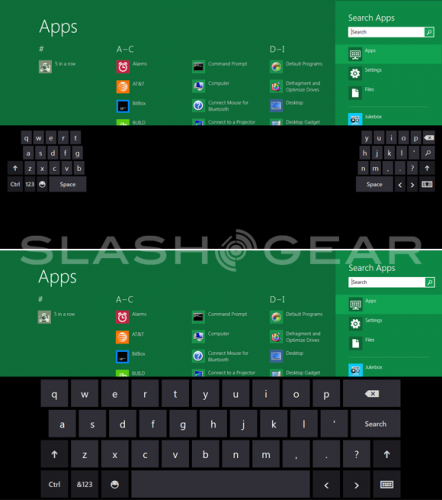 Any app on Windows Phone 8 can be turned into a Secondary Tile. You can, for instance, “pin” a webpage to your Start Screen – in this case you’ll have all the same features your original app had, here because this is a webpage and your original app was a web-based app, you’re able to see a changing feed straight from your desktop. Charms are next – what this feature, activated by a swipe across your screen, is comprised of several icons, these depending on the app or location inside your system you are at. This may seem intuitive to those of you who’ve been using computers for years and years now, but as software engineers make the transition between mobile and stationary OS being separate to being one in the same, it’s little points like this that make all the difference. 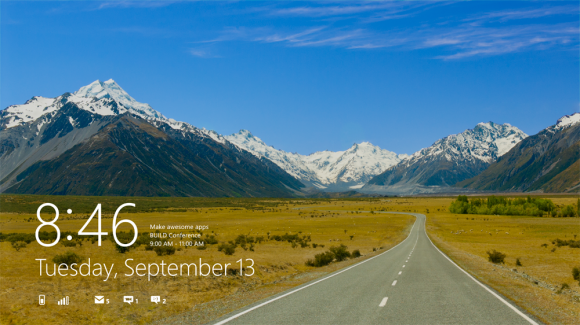 What Microsoft is showing us here in Windows 8 is their next step towards a singularity in operating systems. Moving in and out of apps, shutting them down and opening them up, and even having more than one application open and working at once on the same page. This again is something that desktop mobile operating systems have been able to do for many years now, but as mobile moves into the fold, this is a big step taken. There’s a button, be it physical or on the screen, wherever, that will always bring you back to your Start Screen. This is your Windows Key. If you’re using a Windows 8 tablet, you’ll likely have a physical or haptic-feedback-filled Windows Key. If you’re using a device with no physical keys, the Windows Key will be in some sneaky places for you to access. For developers (who will be mentioned many more times before this guide is through), it’s the newly minted Windows Store that should be paid attention to. 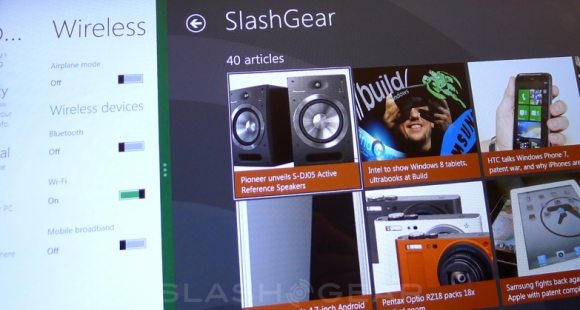 Windows users will be able to access this store for apps anywhere Windows is sold worldwide. Go wild! Microsoft feels that all apps should be able to work together, all of this without any extra work done by the developers of the apps in question. One of the most obvious “contracts” this connectedness will be working on is sharing. Have a bit of content you’d like to share? Grab your Charms, hit the Share Charm, and share it through, for example, “Friend Share.” Here you’re able to contact your contacts through a huge variety of ways – share and go! The data package is taken by one app and sent to another app, all of this possible with any set of apps that have sharing activated. Sharing can happen from any app in Windows. Search is next, it being one the most essential bits in any successful computer system, operating systems a must. The Search Charm is present in quite a few apps and in the system to search files. You expect Windows to know how to search files, but here we’ve got a few new options, one of them being autocomplete of options if you like. You search your term and you get results PLUS you get a list of apps that are able to also search themselves. Search a term and find results on your own computer, then search through your web app, search a social networking site, search anything that supports search. A hypothetical situation for this ability to search and select content from a variety of apps and services is if you’re creating an album of photos on a website. You can search from your local device, your app which seeks photos you’ve got on a cloud on the internet, and an app that seeks photos on your local network. Grab em all without having to launch every single app, all at once with search only. The selling point, if I may be so bold here, is that the apps are what makes up the system. Just like console video game systems, inkjet printers, and… well… every home computer in history, essentially, this system relies on the apps that it runs to run. That’s the promotion in part. Spellcheck, auto-correct, “squiggle” underlining of words to show you they’re not necessarily understood by the system as English (or whatever language(s) you’ve got running). 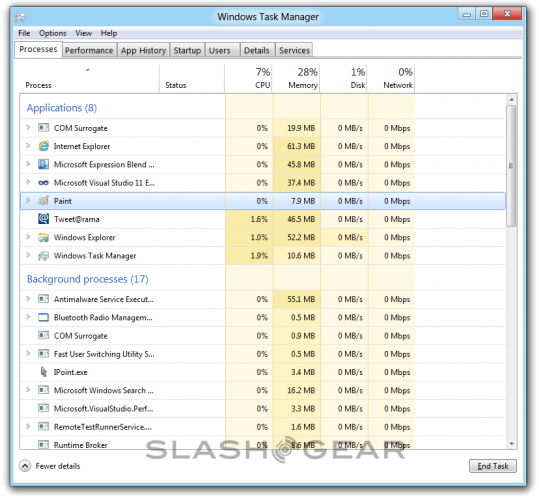 All of this is what you remember it as being from your current and past tens of years on your Windows machine – all of it’s intact here and is available free as part of Microsoft’s dealings with third party app developers. The same is true of the on-screen touch keyboard keyboard. As you may well know by now, computers of all types, most recently mobile devices like tablets are able to connect to a plethora of other devices via Bluetooth, HDMI cable, USB, and a bunch of other slightly less popular means right this moment. In Windows 8, these connections will be handled by your Charms. Much in the same way that selecting File-Print works in most Windows systems now (though I’m sure some developers would disagree), you’re able to hit a charm, hit print, and if you like, work with a selection of settings. This interface has another name: Measuring Style Device App. What a Measuring Style Device App does is represent a device in the system. This could be compared, if you wish, to drivers provided by manufacturers for specific devices, instead here it’s a whole new entity called a MSDA (for short) and has the ability to bring you a large set of options in, for example, a Charm. Top to Bottom: Use the User Interface, in this case see your controls for webpages. Of course you can create new tabs including the forever helpful “private” tab, you can travel to webpages, go back and forth, and use the internet in the same sort of hands-off way that all great web browsers work with. 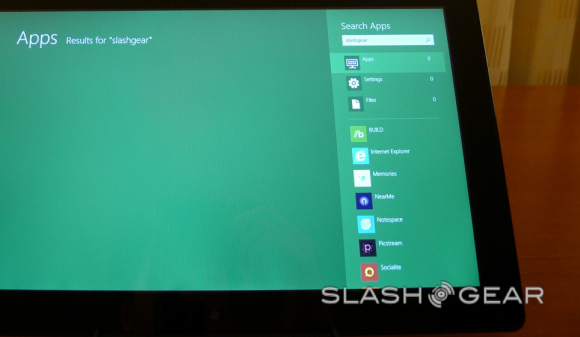 Internet Explorer 10 is able to go full screen and will, with gestures, be able to access the same lovely menus many other Windows 8 optimized apps will be able to as well. Adobe’s photo editing app has become so well known and used that an edited photo in our modern world is better known as having been “Photoshopped” than it is as having been “modified” or “photo manipulated”. 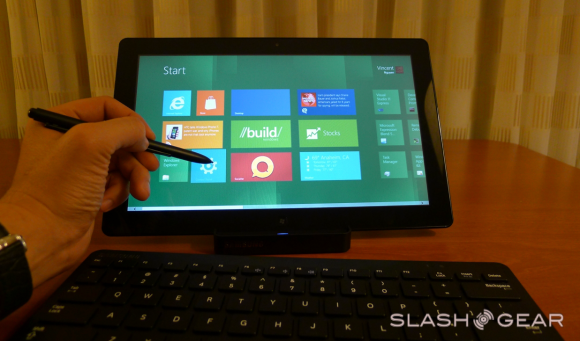 We know this week at BUILD 2011 that Windows 8 will work with Photoshop on a touch platform. This isn’t the first time we’ve seen Adobe bring a Photoshop branded app to a mobile platform, but it is the first time we’ve seen what appears very much to be a full-fledged Photoshop app that, as you know from above, will be able to work with keyboard and mouse, but will here be able to work with touch in a way that’s only been available through third party touchscreen displays and drawing pads. What we can hope for is a much more optimized experience in the near future. 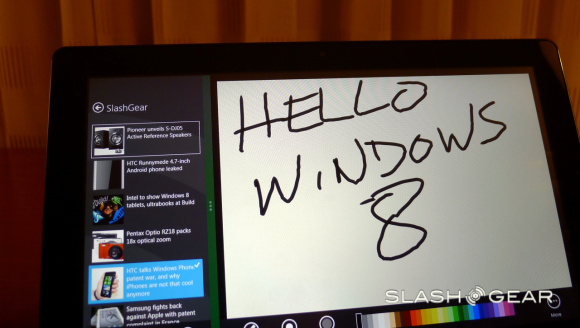 Handwriting, drafting, and graphic arts are promoted in Windows 8 by a new optimization and integration of the pen, or the stylus as you may call it. You may use pen with touch at the same time and you may navigate the whole system with pen as well. Much in the same way that the on-screen keyboard, the physical mouse, and the physical keyboard are all supported for 3rd party developers by Microsoft, so too is the Pen. Get your drawing hand out and try to remember what it was like to use a pencil! 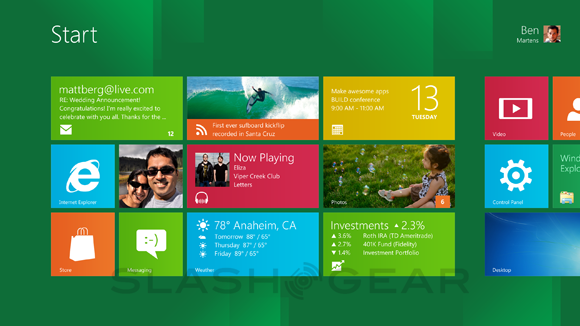 Windows 8 will have the ability to work with online clouds of information, developers at Microsoft keeping in mind that this new operating system is most certainly going to be used to access the connected web on many levels and with many different devices and types of devices. Microsoft gives one of the most obvious reasons for this: what if you reach an awesome level on your favorite game, then you’ve got to switch to a new device? You’d have to start over if it wasn’t for the idea of cloud computing – all that information can be stored for access by multiple computers without a hassle, and Windows 8 is built with this idea deep in its heart. Settings down to the state you last left your app in can be saved to the cloud with this system. One you, one system, any number of multiple machines to work with. Improvements have been made to your basic Mail app on Windows 8. You’ve now got the simple addition of Folders to your Mail app, this right next to Inbox and Content. Organization is key, and the ability to place pieces of content in folders has been a tried and true way to make this happen. As far as Calendar goes, you’re now able to view more than one person’s Calendar at once. For instance if you need to see your wife’s calendar at the same time as your own to plan an event, this dual display mode can come in extremely handy. There’s an app called People which organizes all the humans you know, each of the people displayed with connections to their Facebook, Linkedin, phone number, email(s), and more. This app People acts as an all-encompassing social network hub as you’re not only able to connect to People’s different profile pages on social networks, you can instant messenge them through what appears to be every single instant messenger network in existence, threads of conversation set up, organization abound. The networks take a back seat, Microsoft hopes here, to your connection to the person. Your Photos library app connects you to your local photos as well as photos (and other types of images) you’ve got on a large number of photo hosting services and apps. This app, like the rest of the content browsing and interaction apps, appears to be working quite quickly and efficiently on every platform Microsoft is using to show off Windows 8 at BUILD 2011. This Photos app brings your photos together in a way that Microsoft hopes is easy to manifest and understand. Select photos, place them in your digital basket, and share them, only a few gestures from start to finish. 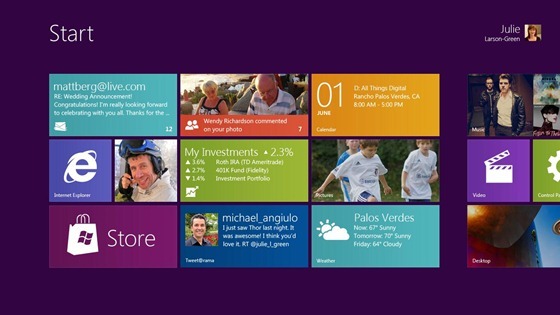 Connected applications is at the heart of Windows 8. Using Windows Phone, you likely know about Skydrive which allows you to place media for later editing and access from the cloud. 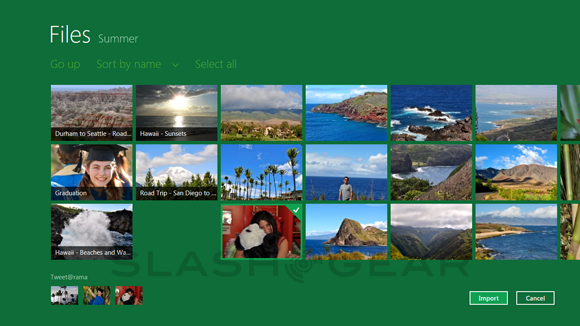 Your Skydrive Camera Roll on Windows Phone automatically collects photos you’ve taken and uploads them to the cloud. When you’re emailing photos from your Photos app, you’ll automatically be doing so using Skydrive, this allowing you to have these photos hosted by Skydrive instead of having to pack them into the email. You’ve got the option of attaching to the email in a traditional way as well, but Skydrive gives you the ability to, in many cases, send a whole lot quicker. Heading online to Windows Live and Skydrive will also be optimized to work with Windows 8 to give you access to any of your connected computers. For example if you’re out in the park and you meet Auntie Sue and you want to show her a picture of your half-uncle Fred but all your Fred photos are at your PC at home, you can connect to your PC at home with your mobile device by accessing Windows Live in a web browser and check your Skydrive, there’s your content.